The word avalanche is derived from the French word avalance meaning descent. An avalanche is a mass of snow, often mixed with ice and debris which travels down mountain sides, destroying all in its path. Avalanches occur due to any of the following triggers: overloading, temperature, slope angle, snow pack conditions, and vibration. Overloading is an important trigger, the weight of the snow increases until it overcomes cohesion to the snow pack underneath. Temperature has an effect on the cohesion of snow; a rise in temperature weakens the bonds creating weakness, whilst a fall in temperature increases the brittleness and tension of a slab. Slope angle is important as most avalanches occur on slopes between 25 and 400C, although avalanches have been noted on slopes as gentle as 150C and as steep as 60oC. Snow pack conditions is a significant factor as the layers below the upper snow can not be seen and it is difficult to assess whether the slope is likely to fail. Vibration is a physical trigger cause by thunder, a gun shot, by explosions or other loud noises such as shouting. 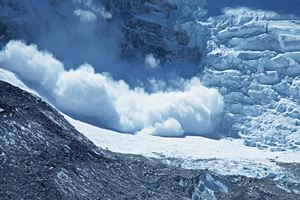 Earthquakes can start avalanches, as well as noise from heavy machinery. Mountainous areas throughout arctic and temperate regions which have slope angles between 25oC and 60oC are at risk. However, other conditions may affect the likelihood of an avalanche being triggered as already mentioned. The avalanche problem is more severe in Europe than North America due to the higher population densities in the Alp mountain range. What Types of Avalanches Are There? There are three main types of avalanche: Powder, Slab and Wet. Often start from a single point and accumulates snow as it moves down the slope forming a snowball effect. This type is most common following heavy snowfall of one inch per hour or more and often on a smooth surface such as after rain or frost. Without the cohesion with the snow layer underneath the snow is too heavy to settle. This type of avalanche can travel between 62 and 186 miles per hour. Most common type of winter avalanche due to the build up fresh snow. A slab is a compact snow surface layer that can detach from a weaker snow layer underneath. The slab slips forward as a whole block or breaks into pieces. Often occurs after a warm spell or during the spring thaw. Snow becomes heavier as it begins to turn into water. Occurs frequently and are generally small and generally easier to predict than the other types. The Cascade Range, Washington is the worst avalanche disaster in the USA to date. Three snow-bound trains were swept into a canyon which killed 118 people. This avalanche occurred when 300,000 cubic metres of snow slid down a 30 degree slope which reached a speed of 60 miles an hour. Chalets were covered in 100,000 tons of snow, killing 12 people. During World War I approximately 50,000 soliders died due to avalanches at the Austrian-Italian front in the Alps. It is thought the avalanches were caused by the artillery fire.